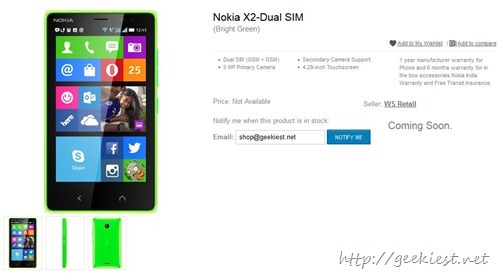 Earlier we have posted Nokia X2 could be launched really soon in India justifying this Flipkart, a leading online shopping website listed the Nokia X2 to their products. The two color variants are listed as of now, the Bright Green and bright orange. The price of the phone is not revealed on the website, it is expected between INR 8,000 and INR10,000. The date of launching is also not listed on the website but you can enter your email to get informed when the phone is available on the market. There was a lay off of 18,000 Microsoft employees where most of them from Nokia division also Microsoft CEO announced they will discontinue the Nokia Android Phones. This move will reduce the interest in the Nokia X2 phones too. The phone may get support from Microsoft even after they stopped the Android phones. 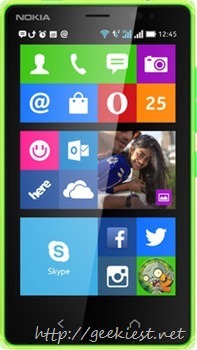 Nokia X2 have a 4.3 inch display 1.2GHz dual-core Snapdragon 200 processor, Adreno 305 GPU and 1GB of RAM. Internal storage of 4GB, and 5MP with LED flash. The Indian market will get a dual sim variant of this phone.